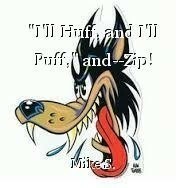 "I'll Huff, and I'll Puff," and--Zip!, poem by Mike S.
"I'll Huff, and I'll Puff," and--Zip! You call that a blow? where did it go, what did we spaz out for? but heavy winds, there wasn't any! over-hyped again, without a doubt! Ha! Glad it didn't come to much, Mike. Over here they got a lot of criticism when they didn't forecast it as going to be bad -- now there's weather panic all the time. One day they'll catch us out because we won't take any notice after they've over-stated it for so long. Thanks, Hully, and yeah, they kept pushing the start time back, but it never did hit full force--oh, we had some wind, but nowhere near what they were forecasting. They even had the national news sitting around waiting, and predicting how bad it was going to be--I suppose better safe than sorry! This page was created in 0.3748 seconds.